The newest and better version of Apple Inc.’s iPad tablet computer went on sale Friday afternoon. Apple fans waiting for this moment for a long time and some of them even traveled from Russia or Japan just to get an Apple iPad on its first day on sale. Though the tablet didn’t go on sale until 5 p.m., lines began forming even before the stores opened for business. Apple stores closed their doors from 3 p.m. to have time to prepare for the sale. When they reopened two hours later, most of the stores had hundreds of people waiting in line. At the Galleria location, Twitter user Jeff Kibuule reported a count of those waiting at 970. Some of them have been waiting for eight hours or even more, without food, drink or sleep. When the original version of the iPad went on sale in April last year, Apple said it sold more than 300,000 in the first day. It ended up selling more than 15 million in the first nine months, including 7.3 million to holiday shoppers in the October-December quarter. The new iPad comes with several improvements over the original, but the same price tag — $499 to $829, depending on storage space and whether they can connect to the Internet over a cellular network – hobbling rivals’ efforts at breaking Apple’s hold on the emerging market for tablet computers. 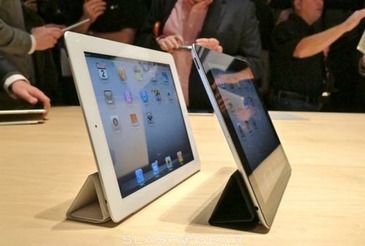 Apple is selling white and black iPad 2’s in three versions 16GB, 32GB, and 64GB. You can purchase a Wi-Fi version or get Wi-Fi + 3G from AT&T or Verizon. If you choose to buy online you can go on the main page of the company and list the iPad 2 options. Apple currently sets the ship date for the tablets between 5 and 7 business days – except for the 16GB black 3G version from Verizon, which has an expected ship date of 3 to 5 business days. If you click through, however, all the devices except the 16GB Verizon show an expected ship date of 2 to 3 weeks. So depending on how many iPad 2’s Apple has on hand, you could have your device by early next week or have to wait until month’s end. Also another advantage is that the company offers free shipping and free engraving for the iPad 2.